The bookshelfitems table contains the individual items that appear on a list. The sortorder field is not required. ACPL uses it to define a custom sort order for other book lists created for our site. The bookshelf table contains the names and details of each individual list. This is not strictly necessary if you’re only maintaining one list. The description, bannerimage, category and date-related columns are not required. 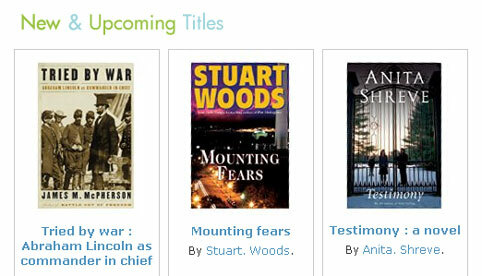 In the case of the new book list, a list with shelftitle “New and Upcoming” was created. Then individual items were added to bookshelfitems which specified the shelfid of the “New and Upcoming” list. iframe height is fixed. The 21 em height of the iframe is a compromise, attempting to set a height that will fit all but the longest titles without creating too much white space. This doesn’t always work. This entry was posted in Koha Customizations and tagged Customization, OPAC on March 12, 2009 by oleonard. How do you pull the records from Koha itself? Or are they manually entered using this tool’s UI and copying and pasting the relevant information from Koha? Couldn’t there be a way to patch Koha to do this? Something like : go to an item, flag it as “new and upcoming”, etc… Maybe from the “lists” functionnality in the staff interface? The staff member has to look up the item and copy the biblionumber. When they paste the biblionumber into the interface for creating a new list item it pulls the title, author, and isbn data from Koha. So there is duplication of data going on between Koha and the separate database containing the new title list. I’d love to be able to be able to do it all from within Koha, but can’t write it or sponsor it myself. As far as I know there’s not any kind of title-level authorized value that could be used to mark something with a flag as you describe. Followed your directions on this but I seem to be missing something. This is the error I’m getting. I need a clue, before I spend the rest of the afternoon on it. Erik, the error you quote is a generic PHP error which occurs when your query fails. It could be any number of things. Have you created the required MySQL tables for storing your book data? Have you populated the tables with book data based on your Koha collection? Have you successfully connected to your MySQL database via PHP? I have created the tables. I have populated the tables. I have successfully connected to the MySQL database with PHP. I’m out of my own ideas right now. aha, well almost however I’ll take this as a big improvement from where I started at. Thanks again for your assistance. Got a quick question for you. I used your java script to move the cover images to the left side in the search results. Now I’ve got a column of blank space on the right side. It was probably always there, but I’m wondering if there was away to shift everything to the right so I could have that column on the left hand side for a navigation menu. Probably a disjointed statement while the coffee is taking effect. What does line number 09 means? I mean, if i enter the jpg of a given book image, how will my system find the image of other books? As i can see, you put 01._TZZZZZZZ_PU_PU-5_.jpg there in your code. I need help. how to popullate the database? where to put this code in upcoming.php? I don’t recommend trying to implement this if you’re a beginner. The purpose of the article is to give the reader a general understanding of the method we used and to give ideas to those wanting to implement a similar system for themselves. can any body explain with picture or print screen how can do New and Upcoming on opac i try to do it but it not coming with me. ahmad: This feature depends on a fair amount of programming outside of Koha to support it. This post was intended to give a sense of what was possible. Unfortunately it can’t act as a start-to-finish tutorial. Owen be nice, and write a step by step tutorial for this. … and in “Set up the Database”, you say “There are two tables, bookshelf and bookshelfitems:”. Do we create these tables and the database? Can’t we use the Koha database and query it for required information? Where do we store this sql part?..Could you specify the path or something? if there is any other way (for beginners) to do this, could you specify the steps?